This is my revisited Bowflex Max Trainer M5 Review 2019. A lot of you have asked for it, and now it’s finally ready, I think you will like it, because it’s one of my most thorough and detailed reviews ever. 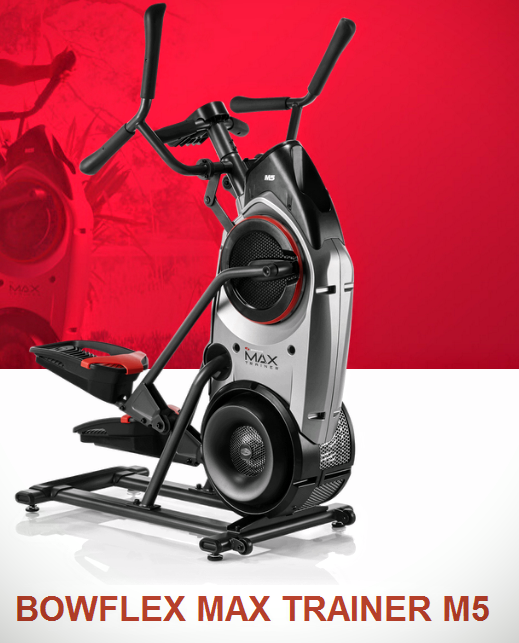 The Max M5 (superseded by the Max M6) is a one-of-a-kind hybrid workout machine. Its unique design combines the best elements of the elliptical trainer and the stair stepper into one. The combination results in the most weight loss in the shortest amount of time – that’s why it’s the Max Trainer. Please note! In the last month of 2018 the M5 model was upgraded is now superseded by the Bowflex Max Trainer M6. However the M5 is still available in Canada. I have updated this review accordingly. If you live in the continental U.S., you may already know this, but Bowflex is discontinuing the M5 model after seven years on the U.S. market. Your best alternative is the new Bowflex Max Trainer M6. You can read my in-depth Bowflex Max Trainer M6 review here. The name does make sense – on the M5, one can burn up to 280 calories in 15 minutes. That’s unheard of. For comparison, jogging burns only about 100 calories in 15 minutes. Lifting weights is even less than that. Sound interesting? This is your comprehensive review of the Bowflex Max M5. Read the good and the bad – if you’re trying to lose weight in the fastest manner possible, you’re going to like what you’re about to read. 4 Review conclusion: Should you get the Bowflex M5? Go to the product page and take a look at the M5’s design. It’s a sleek machine. You’ll notice that the machine looks a bit like an elliptical, and a bit like a stair stepper. That’s intentional. The elliptical and the stair stepper are both good machines – but they’re not 100% designed for weight loss. The elliptical is designed for cardiovascular health. The stair stepper is designed for short bursts of anaerobic fitness. Individually, if you put enough work in, you will lose weight – but it’s not ideal. You’re forced to do one or the other. The Bowflex Max Trainer M5 is ideal. It combines cardiovascular health and anaerobic fitness into one – you’re doing both at once. This is why you burn so many more calories using the M5 over one of those standard gym machines. What’s interesting is that despite being a more refined machine, the Bowflex M5 comes in at just under $1,600, which is about the same price as an elliptical or stair stepper of equal quality – but the M5 is objectively much better. Continue on to see what you get for the price. 16 Resistance Levels. You can adjust your M5 Bowflex anywhere between effortless and extremely difficult. The array of resistance levels allows you to create personalized workouts that feel exactly right. And, because you can go from easy to hard, you can do the equivalent of either jogging or sprinting. If you want fast weight loss, do low resistance; if you want muscle gain and sculpted legs, do high resistance. Integrated Workout Programs. You don’t need to put in effort if you don’t want to, though. There are 9 preset fitness programs for you to follow. Choose from programs like Calorie Burn (for 280 calories in 15 minutes), or MAX Interval (for conditioning), or a more unique one like Steady State (more relaxed, but still effective). All The Accessories. Remember, you’re buying a Bowflex. This isn’t a cramped machine with minimal addons. You get a heartrate monitor, a convenient cup holder, reinforced rubber grips, big foot pads, and more. The Bowflex Max Trainer M5 looks great, and the design is backed up by perfect function. Take a look at the product pictures to see what we mean. The Bowflex Max Trainer M5 also has some tech options that come free. Sound. Integrate with bluetooth connectivity and play sound through the speakers. The speakers themselves are fantastic. Even if you’re going hard, as long as you turn the volume up, you will have no trouble hearing. Phone / Tablet holder. There’s no integrated screen on the Bowflex M5, nor is there a need for one. If you want to watch TV or a movie while you work out, you can pop your tablet into the convenient (and very secure) holder on the front. Or, you can use it fto hold your phone while you play music. It’s up to you! The holder is compatible with all models of tablets and smartphones. Backlit and beautiful. The display looks really, really nice. Hypothetically, you don’t need a futuristic display – you hypothetically just need the machine. But the M5’s elegance and design makes you want to work out once you hop on. It’s a nice touch. Click here to view pictures. Lightweight and easy to store. Fitness machines in the past used to weigh hundreds of pounds. Bowflex uses the highest-quality materials to keep the weight down – the unit is just 143 pounds, but very sturdy. Using the included transport system, it’s effortless to move, but it doesn’t budge or shift when you use it. Perfect. Warranty. There is a no-questions-asked 2-year warranty with the Bowflex M5. This is good in itself. It’s also worth noting that Bowflex machines are known to be very reliable, so along with a good warranty, you’re getting a well-made machine that’s not likely to break. Shipping and returns. Bowflex usually ships machines out in just a few business days from when you place your order. Shipping is free. The unit will arrive in a few pieces, and you follow the easy instructions to put it together. No tools are required. If the machine is somehow damaged during shipping (or you don’t absolutely love it), returns are free, too. If you take the time to read through the feature list above, you’ll find that the M5 Bowflex is pretty much as good as it gets for weight loss. But it’s also over $1,000. Who should spend the money? If your exercise regimen looks like any of the below, it’s a smart buy. One of the best parts of the Max Trainer M5 is the fact that you don’t need to spend a lot of time to burn a lot of calories. As we covered at the start of this review, when you use the preset options for burning calories and losing weight in general, you can burn up to 280 calories in 15 minutes or so (which is also true for the Max M3, the Max M6 and the Max M7). For the casual exerciser, this is perfect. Most of us can’t maintain the motivation to put in hours of exercise at once. Most of us don’t have time, anyways. The M5 lets you get in a full workout (and the weight loss associated with a full workout) in almost no time. Add in the comfortable design and the heap of function and tech addons and you get a fitness machine that caters very well to the casual exerciser. Some of us want to lose weight at our own pace. For some of us, we’re sick of losing weight at a casual pace, and we want to go as quickly as possible. We want to put in consistent exercise and see noticeable results in a short period of time. The Bowflex M5 lets you exercise consistently whenever you’d like, and when you do exercise, you’re burning more calories than you would be with a lesser form of exercise (like jogging). You do the same amount of exercise, but you lose weight more quickly. For this reason alone, the Bowflex Elliptical M5 is one of the most popular fitness machines in existence – it’s more reward for the same amount of effort. The M5 is also customizable to meet the rigorous exerciser’s needs. If you want to push yourself to the limit for 5 minutes, you can do that. If you want to go easy for a full hour, you can do that, too. And if you want to do both in the same workout, you can do that, too! There are preset options that you can experiment with until you find one that suits your workout pattern, or you can create your own if you know what works for you already. The Bowflex Max Trainer M5 is one of the best machines for weight loss – and it’s one of the best machines for getting an evenly-toned body. The entire machine works as a unit so that your arms and legs are engaged equally throughout every motion. Because of the hybrid design, every muscle is engaged, and your core is, too. As you exercise, you are working every part of your body. You’re not just working your legs like you would be if you were running, and you’re not just working your upper body like you would be if you were lifting weights. You’re doing everything at once. Use the M5 over an extended period of time and you will burn fat and gain muscle around every part of your body. You’ll look sculpted. One of the big problems with losing weight is that you look “too skinny” once you have lose the weight – like a marathon runner. With the Bowflex, because you work your entire body, this is not a problem – you end up looking great once the weight is off. Review conclusion: Should you get the Bowflex M5? You don’t necessarily need a machine like the M5 to lose weight. You can jog, or lift weights, or do any number of other exercises. And if you work at it hard enough, you will lose weight eventually. The M5 Max Trainer is for anyone who wants to do everything in one workout – and lose weight faster than normal. To get a full body workout, you don’t need to jog, and lift weights, and everything in between. You just hop on the Bowflex. And when you do, you’re losing weight at almost 3x the rate you would be if you were doing a normal exercise like jogging. If that sounds appealing to you, get the M5. It’s one of the better investments you can make for your health. The machines are advertised so heavily because they work so well – once you see the results you get on an optimized fitness machine like the M5, we don’t think you’ll see any point in going back to traditional exercise ever again. The Bowflex Max Trainer M5 comes in at just under $1,600 ($1,599 to be precise, or C$ 1,999) if you buy from the official Bowflex Canada site. We would recommend doing this over buying it in-store – just under $1,600 is the cheapest you can get it new, and there will be a significant markup at any store you go to. Returns are free if you’re not completely thrilled with the machine. That’s it for our Bowflex Max Trainer M5 Review 2019. It’s a hybrid workout machine that burns more calories with the same amount of effort. You work your entire body at once, the design is state-of-the-art, and there is every customization option that you can imagine. Overall, a very smart choice for anyone looking for more efficient and speedy weight loss.